In today’s modern world the level of competition has raised up to a very high level, a person has to work hard in order to lead an easy and comfortable lifestyle. To lead a comfortable lifestyle you need to get a safe, secure, permanent and good paying job and to get a job, a person has to prepare himself for the interview, which is the first step towards getting a good job. The interview is one such stage where the interviewers create such an environment where the real you come out and that is where the interviewer takes the decision whether you are beneficial for the company and business or not. For that, he may ask you few different and difficult questions like ‘ Describe your work style ‘ and ‘ Describe your work habits ‘. If you and your qualities are beneficial for the company and your mindset is positive towards the growth of the business then chances of getting selected in the interview are most for any individual. In an interview, candidates have to face many different questions, the employers ask these questions and most of these questions are pre-framed and the other depend upon your behavior, personality, attitude, replies and skills. Therefore, an interview is different for every single individual, but still there are some common tricky questions that are asked by the interviewer and a majority of the people are either not able to answer the question or they tend to reply in the wrong manner which directly leads them in losing the job opportunity. One of the most common questions where majority of people are stuck is, “How would you describe your work style?” Not every candidate has to answer about his workstyle, but those candidates who the interviewer cannot judge properly or whom he feels confused about have to give a detailed answer to this question. For that, the candidate must prepare at least few examples of work styles before going for the interview. When a candidate’s personality is suitable for the job, but if some of his skills are un-matching for the specific post, at that point of time the interviewer himself gets confused about judging the candidate. Therefore, to know more things and skills about the candidate the interviewer can ask, “How to describe your work style”. This question actually helps the interviewer to gather more information about your professional working and then he can easily analysis everything and decide whether you fit perfect for the respected post or not. Many times a candidate is not able to explain everything properly and the interviewer starts to assume things that are not actually correct. However, when you interrupt in between for the right explanation, then the interviewer will definitely ask you about your workstyle so that he can reach to the right decision and he gets the detailed view on the working pattern of the candidate. Some candidates are actually weird when they are in front of the interviewer, this weird behavior of the candidate makes it very difficult for the interviewer to decide about the individual, at that point of time the candidate may need to elaborate more about his/her professional work pattern. When the interviewer gets the answer, then he can better assume more things about keeping the candidate or rejecting him directly from the interview. Some of the people who have a higher level of qualification or who have years of experience in the same industry tend to act too over smart which is annoying to the interviewer, so the interviewer can ask about the workstyle so that he can know the reality. When this type of candidates reply to the question asked to them, most of the candidate’s over-smartness vanishes and the reality about the candidate comes out. The interviewer gets to know what exactly does the candidate is capable of doing and not doing. Some of the people who are fresh and do not have any sought of experience in the industry tend to make fake resumes and documents so that they can get to the interview and from there they can easily get a good job. However, these candidates forget one major thing that by just making a few fraud statements and good qualities in the resumes and papers, the candidate cannot change his features. The interviewer is trained in such a manner that he can easily catch such cases and more over with years of experience in the same field and profile, the work of catching the fraud people become even easier and fun to watch when they are asked to tell more about their work style. This question can be asked to the candidates who have more experience in the same industry in order to know more about the quality, skills, work pattern and capabilities of the candidates. This helps the interviewer to place a well deserving and hard working candidate in a better position to which he has applied. First of all, you must know what is your work style. Many a times it happens that people when asked about their work style, gets anxious or they mess up with multiple things and even some people get blank and numb for some time for thinking about in what manner do they actually work. In all these situations, the candidate increases his chances to lose the job. Let us see some of the most common mistakes and things that you should avoid while describe your work. Many a times, people when asked about their work style starts shooting up very fast with multiple things, this generally happens because of the excitement and anxiety that an individual has while giving the interview. However, when we see this response from the interviewer’s side, then it creates a very wrong image of your mental states because it clearly shows that you do not have a stable and calm mind that is needed much to handle the different situations while doing your job. Therefore, when you rush, even with a big list of good qualities, skills and benefits the interviewer ignores it and your dreams of getting that particular job breaks immediately. When questioned about your work style, then you need to answer to the question, but some people get blank and sit numb during the interview. This happens because of two reasons, which are either the candidate is too much nervous and afraid of facing an interview or the candidate is thinking about the work style that would actually impress the interviewer. This creates a very negative impact on the interviewer’s mind and he gets a clear view that the candidate does not have a defined work style and he is not perfect for the applied post. Many people start telling and explaining about their previous job experiences and the work styles which they actually followed in their previous job, which is very irrelative to the job that they have applied. 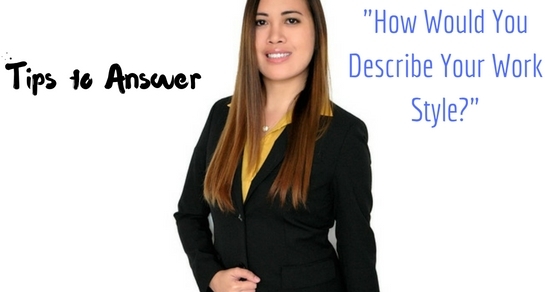 So you need to keep in mind that when you are explaining about your work style, then you need to elaborate on only those things which are, some or the other way related to this post for which you are facing the interview. By doing this, the interviewer will get a clear view of the benefits of your work style to the company and your chances to get the job will automatically increase. Many a times the candidate who have years of experience also make a mistake in describing about their work style because they too come up with a long list of achievements, accomplishments, methods, skills, qualities which takes a very long discussion. However, when you are facing an interview you do not need to go up with everything and every detail that takes a lot of time. Many a times the candidates who are fresher in the industry come up with weird and non – relative working patterns that are very unacceptable in a professional working environment. Some people come with work styles and practices, which they followed before and would have a negative impact on the post for which they have applied. All these things are very annoying to the interviewer and these decreases your chances to successfully pass through the interview. When you are describing about your work style, then you need to go slow along with a calm mind, this will help you to explain everything in detail and it would help the interviewer to understand your work style clearly. Moreover, when you are describing about your work style with a calm and stable manner then you will not forget and miss anything which is important to describe. When you are describing about your work style, then do not ever tend to make it a long description, just you need to focus yourself on the key factors that you make the whole things clear to the interviewer. When you do so, the interviewer also understands the main things properly and you save much of yours as well as the interviewer’s time. If you tend to start up with a long description then your description about your work style may be ignored and all your energy will go wasted. These are some of the things, which the interviewer always wants to hear from a deserving candidate. Therefore, you need to describe all the points briefly and in a straightforward manner so that the interviewer gets a clear vision of all the positive and beneficial aspects of haring you for the particular job. Many times people who become over punctual in life tend to leave all their work, as their working hours are over, so never be a clock-watcher in your job. You need to explain clearly to the interviewer that work and job is your first preference and you will complete the given and the pending work and then only leave the work place, this shows your dedication to work with the company and the interviewer also considers it as a positive point in you. You need to explain your work style in such a manner that the interviewer gets to see all the positive and beneficial aspects of hiring you for the particular job and there is no room left for any negative or wrong thought that can come in the interviewer’s mind. When you act accordingly, then you are gradually on the way of passing through the interview without facing any other questions and queries and you would likely get the desired kind of job for which you have faced the interview.